Based on the 2014 novel of the same name, To All the Boys I’ve Loved Before is a quirky teen romance Netflix original film, released on the 17 August 2018. Lara Jean Covey (Lana Condor), pictured above in her turquoise and pink bedroom, is our central protagonist who accidentally-on-purpose becomes the centre of a love letter scandal at her high school, much to her embarrassment, and in the end, her romantic success (not a spoiler, considering the genre!). Having written secret love letters, without the intention of ever sending them, to the five boys she’s previously had a crush on, Lara Jean is thrown into the middle of a love-hexagon as her letters are distributed without her knowledge. Chaos ensues as she attempts to maintain composure and consequently ends up stuck in a web of lies to protect her sister. Stylistically the film is aesthetically pleasing through its incorporation of 90s fashion and attractive colour palettes. The denim skirts with high neck jumpers, bright striped tops, and Lara Jean’s love for scrunchies to pull back her hair, all add up to a sense of nostalgia through this imagery, where the film likens itself to other American teen romances from two decades ago like Clueless (1995, USA) and 10 Things I Hate About You (1999, USA). 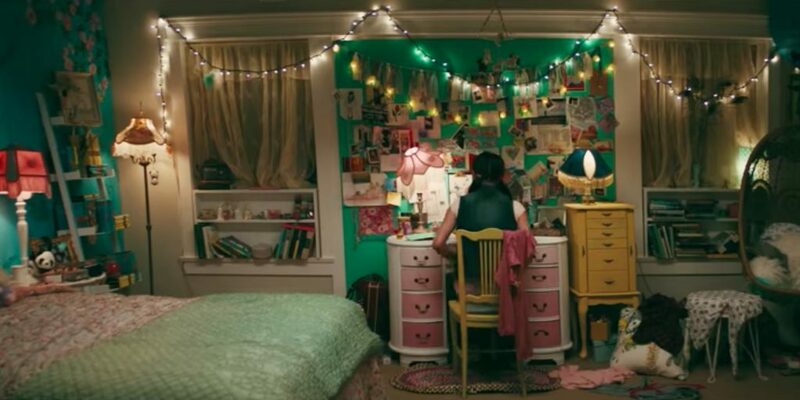 Lara Jean’s bedroom is also another focal point in the film, as she spends the most time there, pining over her lost loves and mulling over her options when the ‘secret’ letters hit the fan. The vibrant turquoise and pink combination (see top image of this page) gives her space a princess-mermaid vibe, and the messy appearance of her floor-drobe becomes representative of how things are going in her social life. Her untidy habits are frequently poked fun at by her father (John Corbett), and sisters (Janel Parrish & Anna Cathcart). When she finally decides to tidy up her room, this coincides with pivotal romantic changes and shows her family, and the film’s audience, the importance of reexamining the junk in our lives, both in our living spaces and in our heads, in order to move forward and over our own obstacles.